Good Luck My Sweet Friend! Hello friends, How are you? Hope you are having a great week. 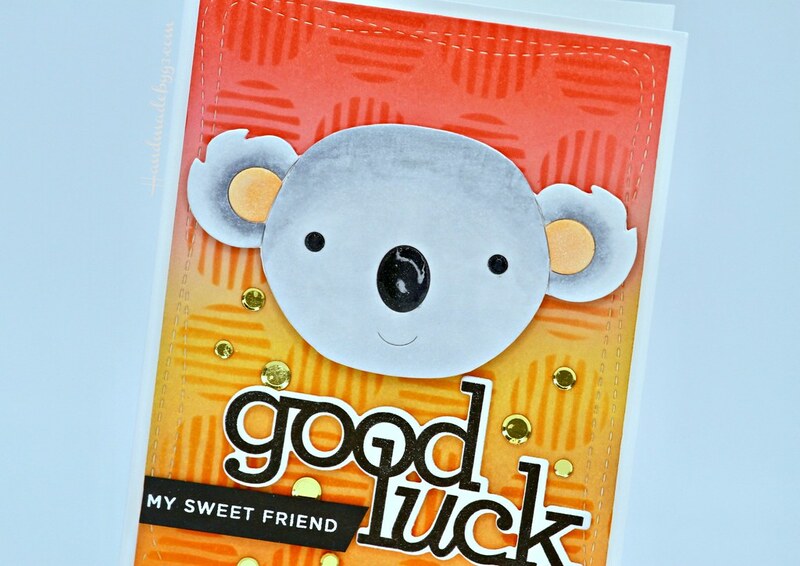 I am here to share another card with you using Simon Says Stamp Fun and Festive collection products. 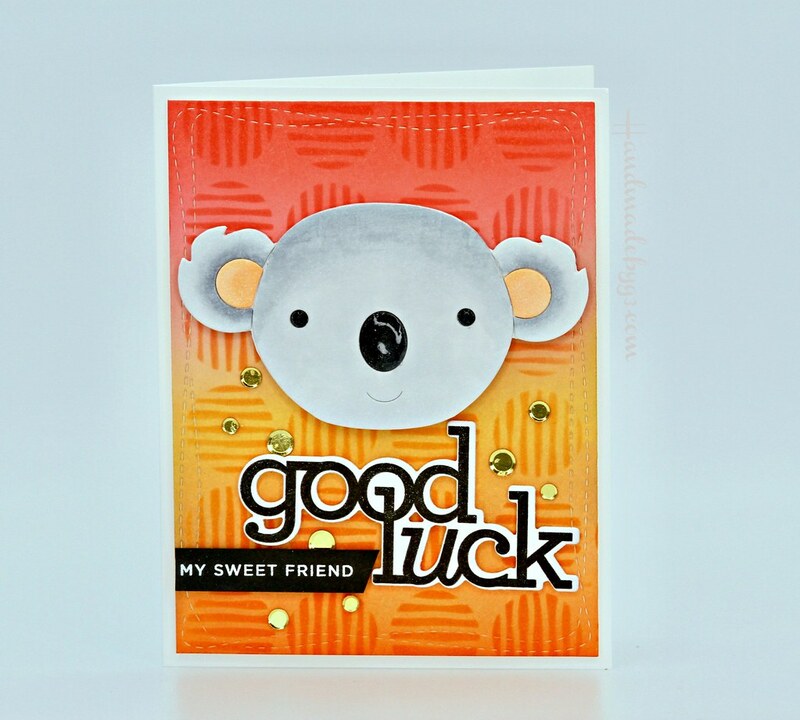 I have used the new Picture Book Koala die and Line Circles stencil to make this card. I die cut a Neenah Solar white cardstock using the largest wonky stitched rectangle die from Wonky Stitched Rectangle die set. Then sponged the panel with Abandoned Coral, Dried Marigold and Carved Pumpkin distress inks. Then I placed the Line Circles stencil over the panel and sponged Abandoned Coral and Carved Pumpkin distress inks in ombre from edges to inside of the panel. This adds interest to the background panel. I adhered this panel to the white card base. For the focal image, I used the new Picture Book Koala die. I die cut the Koala using Neenah Solar White 80 lbs cardstock and coloured using copic markers. Then I used the die to trace around on a white cardstock, cut it out to be used as backing for the Koala die pieces to be adhered to. This also makes the Koala sturdy. I adhered the Koala on the top centre of the sponged panel using foam adhesives. The sentiment is from STAMPtember release stamp set called Great Things by CZ design. I love this stamp set for its fabulous sentiments. 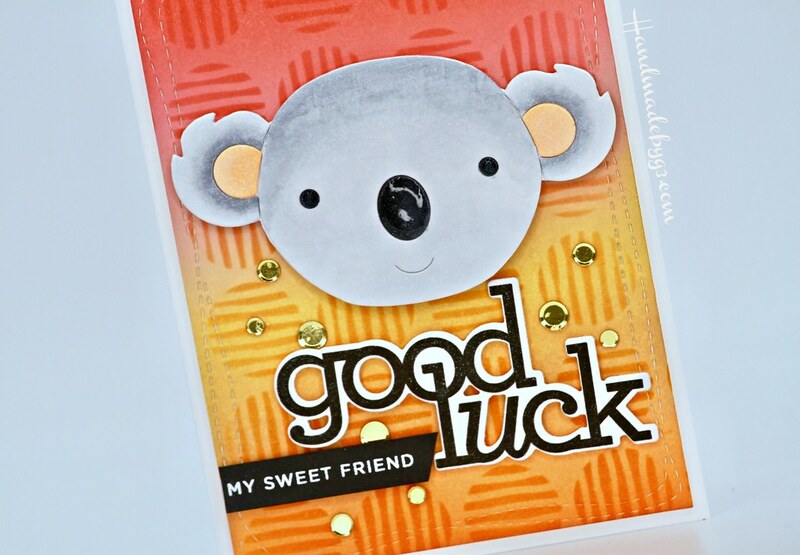 I stamped the Good Luck stamp in black on white cardstock and die cut using the coordinating die and adhered below the Koala. The secondary sentiment is white heat embossed on a strip of black cardstock and adhered besides the large sentiment. Finally embellished with some Gold confetti and added glossy accents on the nose and eyes.